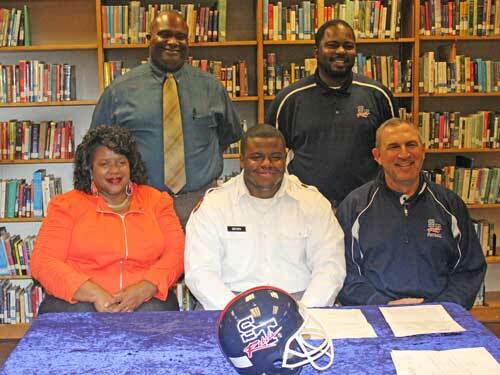 Left to right front: Ms. Endie Curry, Octavious Brown, Head Coach Lee Sawyer. Left to right back Athletic Director Louis Scott, Coach Leroy Collier. Strom Thurmond graduate and star football player, Octavious Brown, signed to play football for Youngstown State last Wednesday morning at the high school library. Joining Octavious for the ceremony were his mother Ms. Endie Curry of Trenton and Head Coach Sawyer, Coach Collier and Athletic Director Coach Scott. Octavious recently completed his studies at Georgia Military College. Youngstown State University is located halfway between Cleveland, Ohio and Pittsburgh, Pennsylvania. The Penguins had a 7-4 record for the 2012 season including a 31 to 17 victory over Pittsburgh in the season opener. YSU has announced 7 regular season home games for 2013.